Saturday was a pretty slow night at work. It’s not often that my supervisor looks at me and says “Go enjoy dinner.” Most nights, I’m lucky if I have time to hit a drive thru. Since I had a little extra time, I decided to do take out from a place I’ve been wanting to get to for some time. 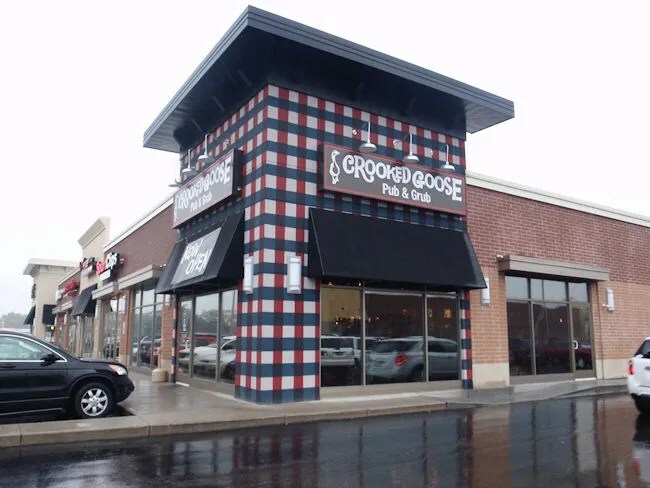 The Crooked Goose Pub & Grub is a sister restaurant to the Twisted Rooster. The concepts are pretty similar. High quality pub food. 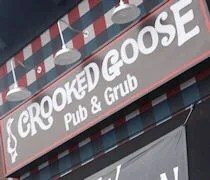 The Crooked Goose calls Standale home. The restaurant is at the corner of Wilson Avenue and Lake Michigan Drive in a small strip mall in front of the Meijer. I called my order in around 5:15 and was told it would take 15-20. That’s about how long of a drive I was going to have from downtown Grand Rapids if I took surface streets, so that’s what I did. I was met by a host as I walked in the door and he pointed me to the bar to pick up my order. The place was already right in the middle of the dinner rush as there was a line out the door and only a seat or two open at the bar. I found one of the open bar stools and the waitress noticed me sit down right away. I told her I had called in an order and she checked a brown paper bag sitting on the counter to see if it was mine. She had a few drink orders to take care of first but she printed off my ticket so I could get the money together for her. When I got back to work, I dug in to my sandwich and fries. I ordered the Lumberjack Burger. 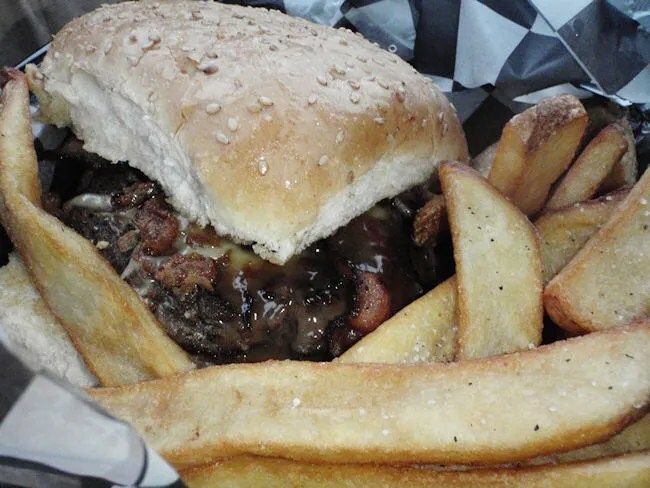 The sandwich is a 1/2 of USDA ground chuck topped with applewood smoked bacon, onion straws, smoked Gouda, and a Maple-Bourbon sauce on a Sesame Seed Bun. I forgot to ask to leave the onion straws off, but I was able to find most of them. It was a huge pile of light, fluffy, crispy onion straws like I was expecting. They were mixed in with the Maple-Bourbon sauce so they had lost some of their crunch which made them a little harder to find. After completing that task, the sandwich was incredibly delicious. The fresh, juicy beef had a nice crisp grill crust with a perfectly slight pink interior. The meal just fell apart with each bite. The sauce was a little scary when I ordered it because I envisioned a burger just dripping in a light, sticky sauce. That wasn’t the case. The sauce did have the sweet stickiness that I was expecting, but there was just enough on the burger to make sure you knew it was there. They didn’t over do it which made me very happy. The sandwich came with steak fries and even these were delicious. Steak fries aren’t always my favorite, but these were cooked really well with a crispy exterior and an interior that was cooked long enough that it didn’t have that potato-y taste that I’m not super fond of. The total bill was just over $11 for my meal and I don’t think I could have been happier with what I got. Take out is always hit or miss. A lot of times, you could have an amazing meal in the restaurant only to end up with a soggy mess if you choose to do carry-out. I definitely did not have that problem at the Crooked Goose. My meal was restaurant fresh and really delicious. I’m very happy I finally had time to check this place out.